The Hobbit Part 2 is the sequel to The Hobbit Part 1, and it is basically part of the Desolation of Smaug and The Battle of the Five Armies, but with some differences and cuts to make a perfect continuity with The Hobbit Part 1, which I recommend you to watch before watching The Hobbit Part 2 (duh). The main differences with the original movie are: No love triangle, which means Tauriel will not feel anything for Kili and Legolas is just a friend. Tauriel, as in the last fan edit, will be motivated by her duty of doing good and fight evil with Legolas. Tauriel will die, something they had to do since the beginning, and since she does not appear in the later movies of LOTR, this death will not affect the story. Alfrid as the comic relief was almost completely cut. Finally, the fan edit features a new and more complete ending which I created with some shots of the Fellowship of the Ring. Also, the fan edit includes 2 DELETED SCENES from Battle of the Five Armies, which were not used neither in the Extended Edition or the Theatrical edition, including a deleted speech by Gandalf during Thorin's Funeral. These will add an emotional touch to the tone of the adventure. I have always thought The Hobbit Trilogy is actually very good in it's own way. LOTR is way better, of course, but The Hobbit also has some really interesting, touching and epic moments, but they have a balance problem and a lot of filler. That's why I decided to begin this project a year ago, to combine An Unexpected Journey and Desolation of Smaug in one movie: The Hobbit Part 1. Unlike many people here, I actually enjoyed The Battle of the Five Armies, with some weak points we all know, like that absurd love triangle or Alfrid as the Jar Jar Binks of the story, but overall I was very sastified with the film, but I still believed it needed some modifications to make it way more enjoyable, especially with the fact the film lacked something, reason I decided to wait for the Extended Edition to finish this project. My main intention in this Fan edit is to make a connection between my last fan edit and this one, and also make sure to deliver a better conclusion of the story which should have been 2 parts since the beginning. This fan edit is more aimed to people who actually liked The Hobbit Trilogy, especially The Battle of the Five Armies. This is most likely a respectful job to what Peter Jackson wanted to show, but with some little help here and there from my hand. Many of the proposed cuts in the other fan edits of the trilogy might be not present neither in Hobbit Part 1 or Hobbit Part 2. The Fellowship of the Ring, Battle of the Five Armies and An Unexpected Journey Soundtrack. Sony Vegas 13 was used to edit. 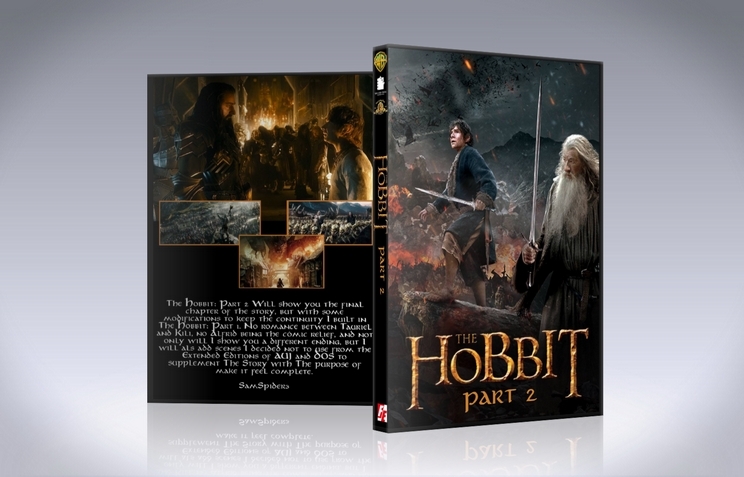 -Two deleted scenes were added, including Gandalf's Speech in Thorin's Funeral. -Almost all the scenes from the Extended Edition were restored. +Film opens with Gandalf going to Dol Guldur, where he finds out Thrain was alive all along, closing the subplot. -Cut all the parts where Bard is shooting arrows to Smaug. As I said, it's a nice action sequence, but still, it's kind of silly because Bard knew Smaug could not be harmed unless he had a black arrow. He is losing efforts. -Cut "Battle of the Five Armies" Title Card. -Cut the scene where Tauriel talks to Kili, and the promise and blah blah. The Scene will look like the dwarves leave the shore and Tauriel and Legolas watch how they get far. -Cut the part where Alfrid tries to convince people of Lake Town he thought about the children when the Master left, and a child kicks him. ,Changed subtitles when Legolas is talking to Tauriel about coming back to Mirkwood. Instead of saying "Yes, he is my father...but he does not command my heart" he will say "but he does not command my WILL" to take out every suggestion Legolas feels something for Tauriel. Also, I read this is the correct translation, so more in favour. Nothing was cut at this point, just a little bit of zoom to write the new subtitles. -Cut the line "If you try to stop me, I will destroy you". Sounds kind of silly. Nothing more from the battle in Dol Guldur in the Extended Edition was used. ,Added a shot of a statue placed in the Elven Gate, when Legolas is talking about his dead mother. In some interview i saw, this statue was built by Thranduil for love. The statue is Legolas Mother. I found this interesting detail very subtle and nice, so i decided to add it. +Added Deleted scene where Bilbo plants his acorn in Dale, giving hope to Gandalf and Bard. -Cut the part where Alfrid disguises himself as a woman to not fight and gets away with the gold. +Added Deleted scene where Gandalf convinces Thranduil his son is way more important than his wife's white gem. -Kili's Death was recut to not make it seem so dramatic to Tauriel's eyes. No romance, remember. Also, cut the shots where Tauriel begins to cry. It will look just painful because one of his allies died. -Cut the part where Tauriel groans after she falls to make it look like she died. -Cut the part where Legolas tries to get some more arrows. The scene was remade to make it look Legolas enrages by the Fact Tauriel Died and Bolg is still alive. -Cut the part where Legolas jumps blocks a la Mario Bros. This was a little bit too silly for me xD. Legolas Kills Bolg shortly after giving Orcrist to Thorin. Nothing from the extended battle with Bolg was used. ,The Battle with Azog was re arranged to be shown completely. No intercuts with Bolg and Legolas because he died. -Cut the scenes where Tauriel cries for Kili and instead replaced with a different scene I made to make it look like Tauriel died and Legolas and Thranduil feel very sad for her. Some bits of music were used to fill the scene. +The speech Gandalf says during Thorin's funeral was restored. -Cut the part where Bilbo discovers the ring is in his pocket after he arrives home. +Added scene where old Bilbo narrates his story and Frodo appears from An Unexpected Journey. Some shots of The Fellowship of the Ring were used. This way, we can resume to the narration from Hobbit Part 1. -Cut all the narration Bilbo says about getting late, he was respectable and blah blah. +Added scene where Bilbo continues to write his book from The Fellowship of the Ring, after Frodo leaves to meet Gandalf. Then Bilbo makes sure nobody is home and prepares some of the stuff for his journey. Then he feels something is not right, he is searching for something. But then he breathes: It's the ring, and it was in his pocket. +Added shot of Gandalf entering Bag End, but without revealing it's him, followed by Old Bilbo sitting in a chair, seeing his ring. Then someone knocks and Bilbo opens the door. For surprise of all, It's Gandalf. The movie ends. ,My name in the "Edited by" section of the credits. It may seem that there are not many changes between the original version and the fanedit, but through multiple subtle cuts, Samspider3 has managed to finish the saga of Middle-earth in a great way. Some elements that have been added, such as Thrain along with the elimination of the love triangle and Jar Jar Alfrid, have helped the rhythm of the movie in a great way, I like to see everything related to Smaug at the same time , I like that we do not have a final as abrupt as the original, I like that we start where we were the last time, I like to see more of the dwarves in the battle, I like that we do not see the eagles until part 2. Any Problems? 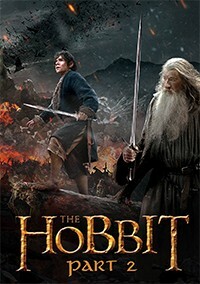 : I think it is too long and I know that it is a Middle-earth movie and it will always last for at least 3 hours, but the problem here is that in general the movie is pure battle, except for the time between the death of Smaug and the arrival of the Orcs. It was not a problem for me since it was a great movie, but when we got to the final battle between Thorin and Azog, I was already exhausted. In general it is a good edition, if you like The Battle of the Five Armies, but wish there were not as many annoying elements as the love triangle and Alfrid, then this is the edition for you. So I watched part 1 and part 2 last night, here is my take on the overall movie. Pacing: I feel like pacing has improve with these edits vs the original film. Less 'goofy' and 'cartoon' cuts which help shorten the movie considerably. Even though some scenes were required because without them it will mess the continuity. Characters: The love triangle was taken out completely and cut down scenes of "Jar Jar binks" was a huge positive. Though personally I liked the dynamics of Azog which was reduced in this cut. Plot: Followed very similar to the original cut. no comment. Music Mix: I really hope that it would used more of the original score from LOTR but other than that it was nicely integrated with the scenes. Some of the flashbacks drag a little too long, especially when Bilbo 'remembered' he got the stone. When Thorin started to show his dragon sickness, it was unnecessary to show Smaug. Overall: Solid Edit and enjoyable!